Ecotrends Ecologics and the Canadian Food Inspection Agency (CFIA) are recalling Wilderness Family Naturals brand Coconut Milk Powder and Coconut Chia Pudding Mix for undeclared milk, one of the major food allergens. Anyone who is allergic to milk or who is lactose-intolerant could have a serious reaction if they eat these products. They were sold nationally at the retail level. No reported reactions have been received to date. 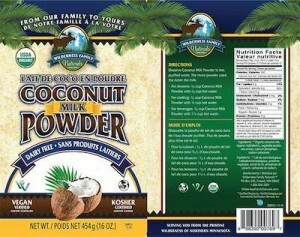 The recalled products are Wilderness Family Naturals Coconut Milk Powder in 454 gram containers. The codes on the products are Best By Date 20-May-17 with lot number 1000011218, and 15-Aug-18 with lot number 1000013229. The UPC number for this product is 8 98392 00769 7. Also recalled is Wilderness Family Naturals Organic Coconut Chia Pudding Mix in 500 gram containers. The codes on the product are Best By Date 05-Dec-17 with lot number 1000011723, and Best By Date 04-May-18 with lot number 1000012520. The UPC number for that product is 8 98392 00779 6. If you purchased these products and are allergic to milk or are lactose-intolerant, do not eat them. Throw them away or return them to the store where you bought them for a refund. You can see pictures of product photos at the CFIA web site.